Bondora continues to work with local courts and the legal system to ensure the highest rate of recovery payments possible. Missed payments are always going to be a part of peer-to-peer lending, but as long as it is possible, we at Bondora will do everything in our power to recover as many missed payments as we can. Of the 28,340 total payments recovered in January, 40.6% were recovered in the default & court stage of the recovery process, while 31.9% were recovered in the bailiff stage. The most recovery payments came out of Estonia (43.7%), while both Spain and Finland had 7,845 recovery payments on the month, a 27.7% share of total recoveries each. 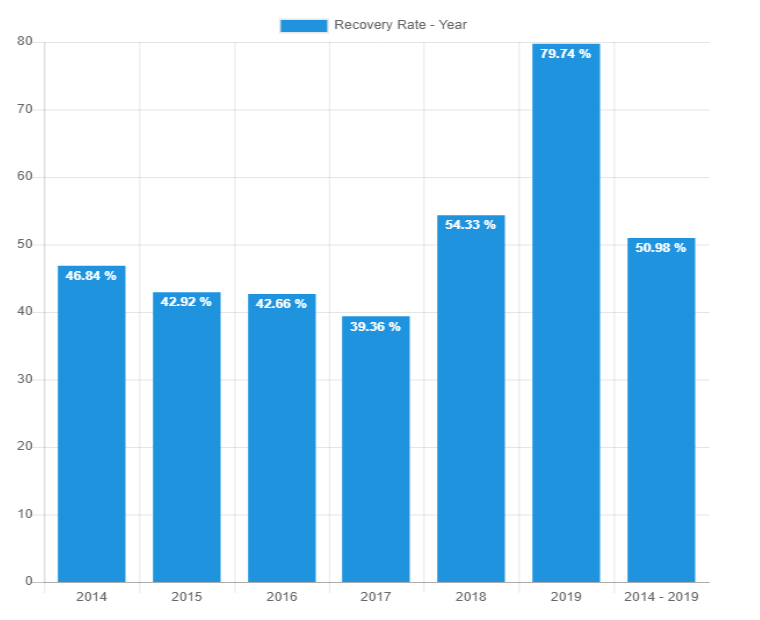 As expected, recoveries in the most recent year are at the highest rate. 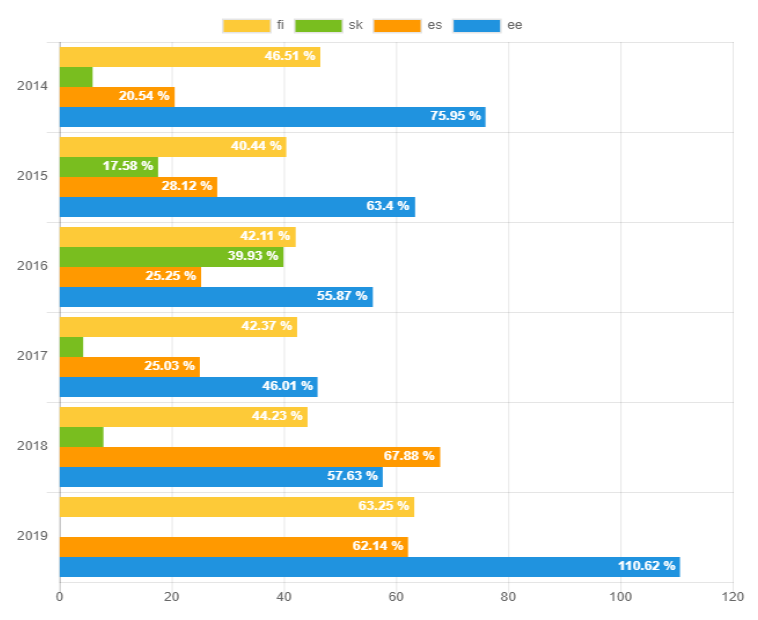 Just one month into 2019 and Bondora recoveries for the year are at 79.74%. This number is likely to reduce over time as the percentage of payments missed increases. Meanwhile, recoveries in the previous several years have not changed this month. 2017 has exhibited the lowest recovery rate, at 39.36%, while 2018 has the highest recovery rate outside of the current year, at 54.33%. Recoveries in Estonia have increased for the previous two years. Rates are up to 57.63% and 46.01% for 2018 and 2017 respectively. Loan issuance rates for 2019 should be discounted until more time has passed and rates normalized over time. In total, €192,740 of Estonian loan payments were recovered in January. Finland has also experienced a significant amount of recovery payments made in January, totaling €110,453. The majority (74%) of recoveries were made in the bailiff stage of the recovery process. Spain bucked the trend across Bondora loans, as the vast majority of recovery payments were made in the default & court stage of the recovery process. 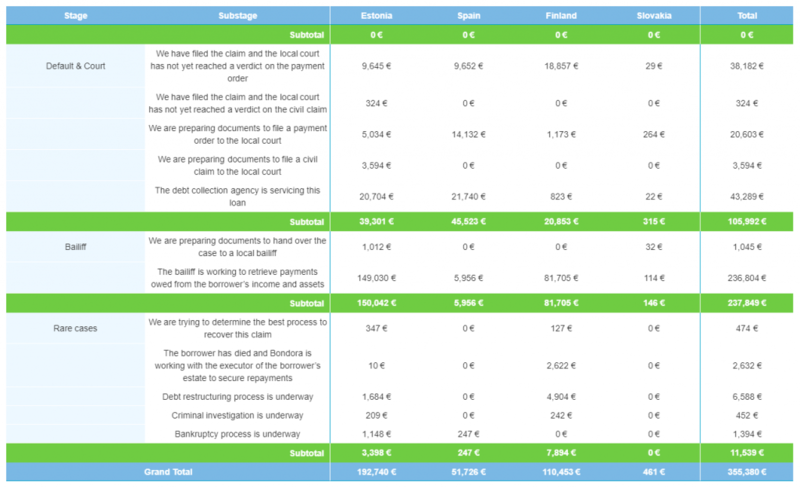 Of the €51,726 in Spanish loan recovery payments, €45,523, or 88%, occurred in the default & court stage of the process. 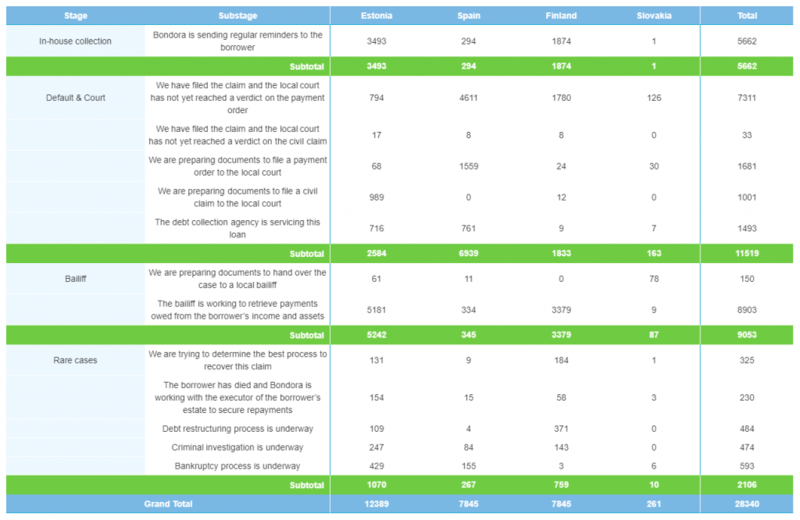 More specifically, most loans were recovered by the debt collection agency (€21,740) and when Bondora prepared documents to file a civil claim to the local court (€14,132). While it’s important for any lender to understand its borrowers and select only those who will repay on time, missed payments are an inevitability of the lending business. This makes a solid, streamlined recovery process an important aspect of any lending business. At Bondora, we have created such a process, moving quickly when payments are missed, and filtering such payments through the appropriate channels which are likely to produce the quickest payments in return. You can always find more detailed data on our recoveries and loans by viewing our real-time statistics.